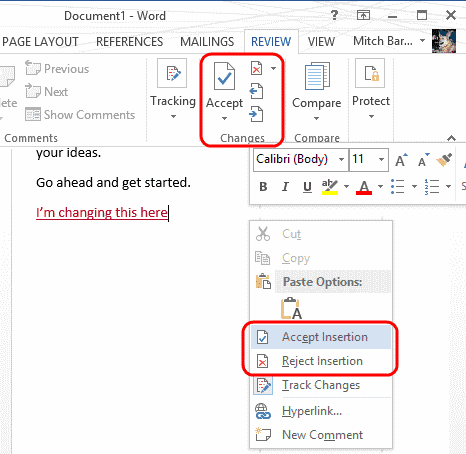 Enable the Track Changes feature in Microsoft Word 2016. With this feature, you can track and view all changes that are made to the document. It’s a feature that comes in handy when editing a document as a team. 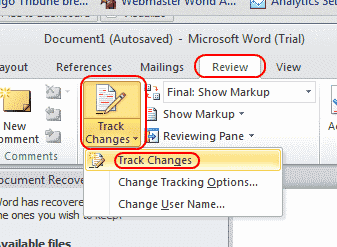 While in the document, on the “Review” tab, under the “Tracking” group, click “Track Changes“. Make the changes you wish to make. 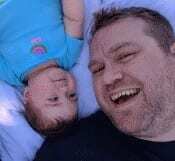 You can also add your own notes. Now another person can review the changes and choose to “Accept” or “Reject” the changes by using the options under “Review” > “Changes” > “Accept“/”Reject“, or by right-clicking the area of text. Why is “Tracking” missing from my Word 2016 ribbon? In Microsoft Outlook 2007 through 2016, you can customize the ribbon. That means that the “Track Changes” option can be removed, and not exist on your computer. You can often add it back by going to the “Customize Quick Access Toolbar” arrow, then choose “More Commands“. From there, you can choose “Customize Ribbon“, then add the “Track Changes” section. You could also use the “Reset” button on this screen to reset your customization back to default settings.